1.A USB C PD charger that supports fast charging. 2.A USB C to lightning cable that supports fast charging. 3.A iPhone X/8/8 Plus that supports fast charging. 1）Compatibility：Compatible with Macbook pro 13-inch, Macbook 12-inch and other USB Type-C devices as well. 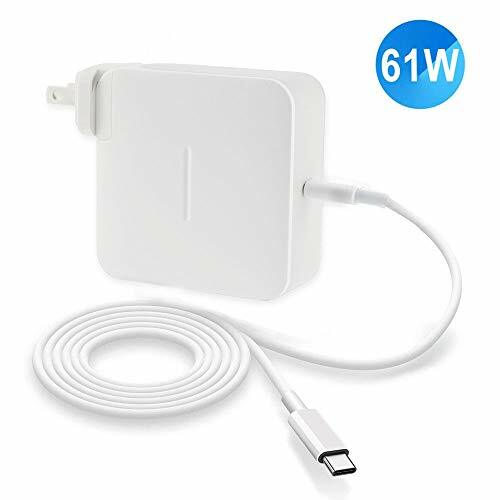 Can be used to replace 29w adapter to charge different Macbook model of lower wattage. But can not be used for Macbook pro 15-inch. 2) Multiple Protection: Certified by RoHS, CE and FCC. OVP/OCP/OTP/SCP keep the charger work stably, completely ensure the safety of you and your device. 3) Absolutely Ideal Length: Includes a 1.8m extension cord and a 2m usb c cable, enables you to charge your device more convenient and save the trouble of having to stay close to wall socket. 4) Fast Charge: If you take a usb c to lightning cable to repalce this included usb c cable to charge iphone X/ 8/ 8 Plus, you also can enjoy a fast charging experience. 5) Smart IC Technology: The advanced technology will intelligently recognize and adjust the current output to match the specific needs of your devices, providing the optimal charging speed without taking risks that may damage your expensive devices. If you have any questions about this product by RAYDOSOM, contact us by completing and submitting the form below. If you are looking for a specif part number, please include it with your message.